Share This:ShareTweetLinkedInThe Bird’s Nest stocks books, plush, accessories and clothing from newborn to 5T. 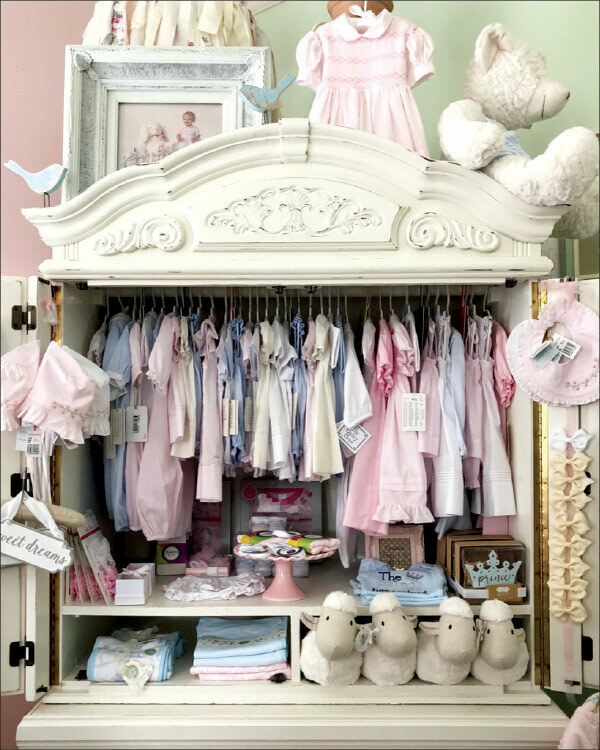 Rhonda Cooke didn’t set out to open a baby boutique, but once her children graduated from high school, the stay-at-home mom decided to channel her creativity and passion for rearranging her house into The Bird’s Nest Baby Boutique. “My family has always had an entrepreneurial spirit, and I’ve always been creative,” Cooke says of why she opened the store in 2016. “Plus, there was a need for a specialty children’s store in our county.” Perched on a street corner in the small town of Warsaw, NC, along the Interstate 40 corridor, the 800-square-foot boutique feels like home when customers walk up the front porch of the historical house and through the shrub-adorned entranceway. How’s business? Compared to our first year, we’re doing much better. We’ve had a steady increase in sales over the last couple of years. Because of snowbirds, usually summer is the slowest season for coastal towns, but we’re far enough from the coast that we still do well even when it’s not beach season. Who is the Bird’s Nest customer? We get a lot of first-time moms, pregnant women and grandparents, many of them from out of town. I do a lot of shipping and Paypal when customers find The Bird’s Nest on social media. What are you best-selling brands? I try to keep up with the seasons. In the summer, I do well with Prodoh, a fishing brand, and Columbia. I also carry special occasion outfits from Feltman Brothers. We’re in a rural community with farmers, so anything with pigs, cows and tractor motifs do well. Brands like Bailey Boys, Banana Split, Kickee Pants, Angel Dear and Zuccini are popular. What about accessories? Stephen Joseph backpacks are big, and we sell a lot of hair bows, swaddle blankets and books. In the winter, Ruffle Butts leggings and footless tights are awesome. We always do well with Bunnies by the Bay swaddle blankets, Elegant Baby and JoJo Maman Bébé. Any advice on how to maximize your baby selection? I have customers come in that say boys are hard to find clothing for because a lot of stores stock primarily girls’. I try really hard to look at boys’ when I’m at market, being mindful to select as many boy options as girl. It’s very easy to overdo it with the girls’ clothing. I’ve successfully curated an even 50-50 split in stock. How do you spread the word about your business? Instagram and Facebook are awesome because everyone finds out about you that way. I research my analytics and although my follower count isn’t high, the followers I do have interact. You look at other stores with huge followers, and I have more likes and comments on my posts than they do. I have a loyal customer base who don’t just follow—they purchase! How else do you draw customers? We’re in a small town, so community events help the most. I have a women’s store beside me, so we’ve held block parties in the past and sidewalk sales. So many people come to those from near and far. I also email coupons to customers who have signed the guestbook I keep in my store. What’s the smartest business decision you’ve made of late? Widening my brand selection. I will ask customers before I go to market if there’s something they like that I don’t carry. This keeps them engaged with me and not looking elsewhere. Where do you see The Bird’s Nest in five years? Well, I certainly don’t plan on expanding. My store is in a small house—and I love it this way! I simply plan to continue fostering good relationships with my customers and expanding my clientele year after year.